GE Fanuc Intelligent Platforms , a unit of GE Enterprise Solutions, have announced the availability of a new version of their Proficy Tracker software that helps companies realise lean initiatives by managing the execution of orders and the related flow of materials. Proficy Tracker is used by companies all over the world to solve the challenging production control problems within their discrete manufacturing operations in industries ranging from automotive to electronics. Proficy Tracker 8.0 delivers lean production control by helping to manage inventory, schedule resources in real time, and control the routing of material through a discrete manufacturing process. The Proficy Tracker 8.0 provides the ability to track the real-time location of orders on the production floor and can also be configured to perform routing logic to control the movement of product throughout the manufacturing facility in real-time. This capability allows manufacturers to manage the physical routing and delivery of multiple product components and subassemblies into complex product assemblies. According to Erik Udstuen, Vice President, Software and Services, GE Fanuc Intelligent Platforms, manufacturing today is shifting from build-to-stock to build-to-order helping companies realise lean initiatives and reduce costs. By maintaining automated control over their operations, suppliers can improve performance by reducing work in process (WIP) inventories, providing automated birth certificates, and building their products right the first time. This will have a direct impact on the company’s bottom line. Proficy Tracker’s order execution management functionality is targeted at handling the ever-changing real world conditions of the production floor and coordination of suppliers. Proficy Tracker provides production order management, bill of material distribution, supplier coordination, sequence and substitution management along with production hold management. Proficy Tracker is a good enabler to achieve a Lean Manufacturing environment. Dynamic, business rule-based scheduling maintains the production sequence and supplier coordination. E-Kanban is achieved through monitoring consumption at the different assembly stations and issuing material delivery requests. And, mistakes can be avoided as Tracker facilitates the process of getting the right products assembled in the right sequence at each station. Working with a variety of production processes, Proficy Tracker makes it easy for users to implement and operate a work-in-progress tracking system. The application utilises data from automated sensors and readers including bar codes, RF Tags, and other mechanical tag systems and provides graphic screens to display tracking paths and item information, and reflect production control commands. The Proficy Tracker maintains detail data for all jobs in the system, including content, status, location, and production process counts and keeps cycle counts, repair information and carrier status online. Proficy Tracker accommodates different types of carriers and containers within a system, allowing manufacturers to track and route products even when the process transforms them. 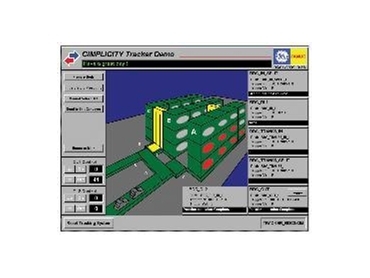 Proficy Tracker accommodates production flow adjustments, from minor modifications to major system redesign. Its automation of tracking and routing can increase the return on existing equipment by automatically sending defective materials to a rework area and scrapped materials to a recycling area; grouping batches of products improving efficiency, reducing setup and waste; monitor carriers in need of maintenance; and provide line balancing during production start up. Company released with Proficy CIMPLICITY 8.0, Proficy Tracker now has a new look and feel based on Microsoft-fluent User Interface (UI) technology. The new UI follows the Ribbon Bar concept, which enables quicker access to galleries and the ability to create custom menus thereby increasing operator productivity. Other new features include new graphics-rendering engine, including larger development canvas functionality for runtime and development, transparency capabilities, improved gradient shading, anti-aliasing, and native picture support. With a built-in CIMView rubber-band zoom tool that enables dynamic zooming from the toolbar, users have enhanced visual accessibility. The value of any software product is its ability to improve business performance. Proficy Tracker, with its order execution management capabilities, is in the industry and offers a solution that manages and adapts to the real time situations that occur on the production floor.